It’s the problem every manager or CEO faces: how do you stay aware of what everyone is doing? Thinkfuse, which debuted at last year’s TechCrunch Disrupt in New York, is out of beta with a product that makes it easy to get a single status report on what everyone is working on across a company or team. The Seattle-based company, which was formed by former Googlers and ex-Microsofties, was inspired by Snippets — an internal tool that Google uses. Every week, Googlers would post a simple status update explaining what they had worked on and what they planned to finish by the next week. All of those updates would go into a report for managers and they would also be searchable for everyone else. Thinkfuse is trying to make this available for everyone. 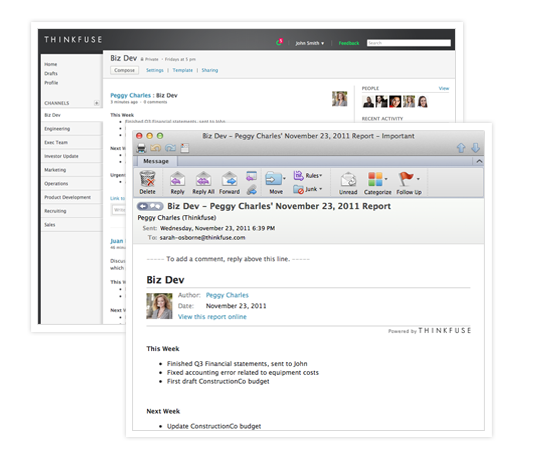 A manager or CEO can sign up with Thinkfuse and then ask their employees to file reports every week by e-mail. It’s elegant because it doesn’t require too much behavior change. There’s no entirely new system to learn and it slides right into e-mail. “It helps make a habit of just pausing for 15 minutes a week and thinking about what’s actually important, what you’ve accomplished and how that lines up against company goals,” said Thinkfuse’s chief executive, Aydin Ghajar. Once all those reports are filed, they’re searchable and they can be organized by team, location or role. Ghajar says that other social apps for the enterprise, like Yammer, get treated too much like Facebook. He says Yammer and Jive end up being more complementary than competitive to what Thinkfuse offers. Another company in the space, Asana, can show what workers are doing at any given time, but it requires them to adopt a totally new system and drastically change their behavior. The closest competitor might be 15five, which debuted at the Launch conference earlier this year. Since launching last year, they’ve enrolled about 450 companies in the beta. This is clearly going to be a freemium product, but pricing isn’t out yet. Ghajar says he’s thinking managers might pay $10 or $20 a month for premium analytics and features. Thinkfuse has raised about a half-million from angel investors including Ali and Hadi Partovi, SV Angel and Scott Banister. It was also a TechStars company.